Classes finished last week, and this week is supposed to be final grading time. 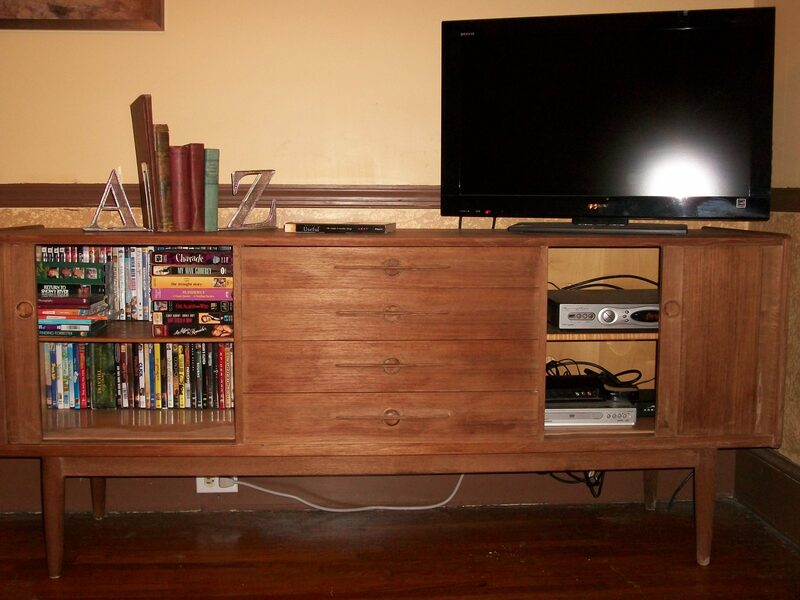 Sooooo, I refinished my entertainment center. Now, in my defense, I have guests coming to stay at my house starting Thursday of next week. They’ve never stayed at the house, so I wanted to use their arrival as motivation to get as many projects done as possible around here. I mean, if I’m going to do them, what better time than when someone else will get to enjoy them. I started the week with visions of grandeur: 5 hours a day of Writing Center wrap-up, 1 hour a day of admin work, a few graded projects a day, and house projects galore. Yes, this indeed was to be my schedule for success except that I’m not good at multi-tasking, and when I took off on this little venture, I forgot how low my end of semester motivation can be. 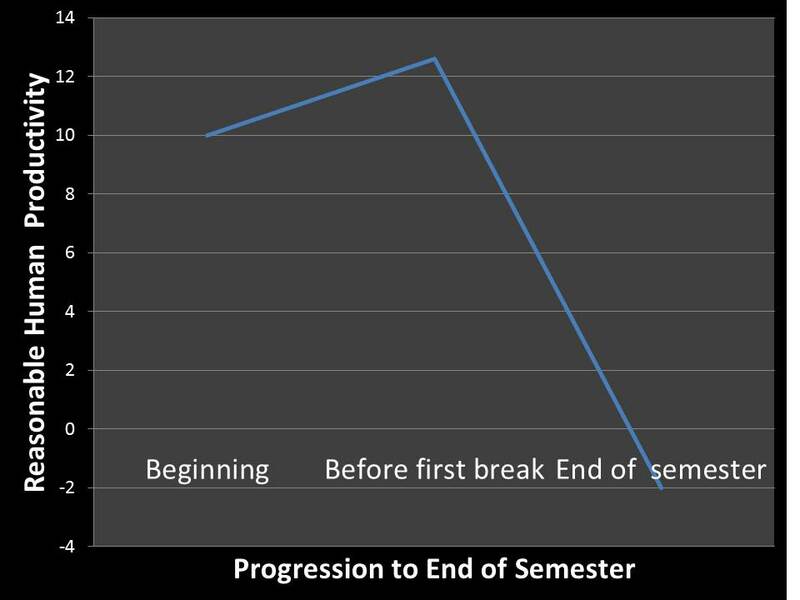 To make a long story short, I’ve charted this motivation for my readers. Now, I’m at the point where I think I can get the house clean for the guests, finish up with grading by Monday, and still have 3 weeks of break in July (instead of 4) after finishing up Writing Center work. Yeah, I can live with that. The entertainment centerproject snuck in right before my optimism bubble burst. Here’s a before picture of the piece. Sorry about the annoying flash, and please extend some grace and don’t be totally grossed out by all that dog hair that was uncovered once I cleared my board game stash off the floor. With those disclaimers aside, I have to say that this entertainment center is one of my favorite pieces of furniture in the house. I bought it for $5 at an auction. The auctioneer couldn’t get anyone to jump on it, and my mom and I looked at each other and smirked at the 70s era piece. I said, “It looks like something from IKEA.” And the wheels started spinning. I stopped smirking and put in a bid right before the auctioneer gave up. I can’t believe I almost lost out on it. I painted it black to fit my black and red living room theme in grad school, and it was one of the reasons that my parents rented a van to come help me move away from grad school because it was one piece of furniture that I did not want to part with. But, as you can see, the trim in the new living room is brown. There’s not a stitch of black anywhere in the room, so the black paint had to go. So, why this week? I should have taken a before picture, but cords were snaking everywhere for all the electronic gadgets. The power strip that’s normally tucked up under the piece had migrated to the floor during a Roku hook-up, and the cable company sent me a new internet modem that I needed to activate. Still, so why this week? Yep, those three characteristics are nearly weighted evenly. 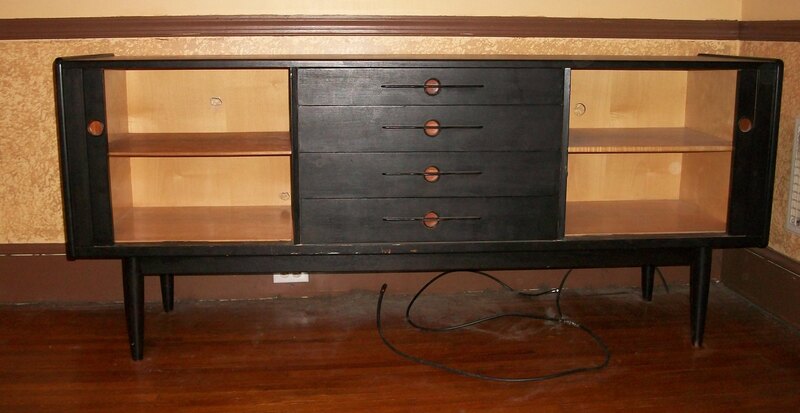 I dread hooking up electronic cables, but I also dread house guests seeing the entertainment center askew with cords. So, if I was going to unplug everything and arrange it neatly, I was only going to do it once. That’s why the paint needed to go — now. 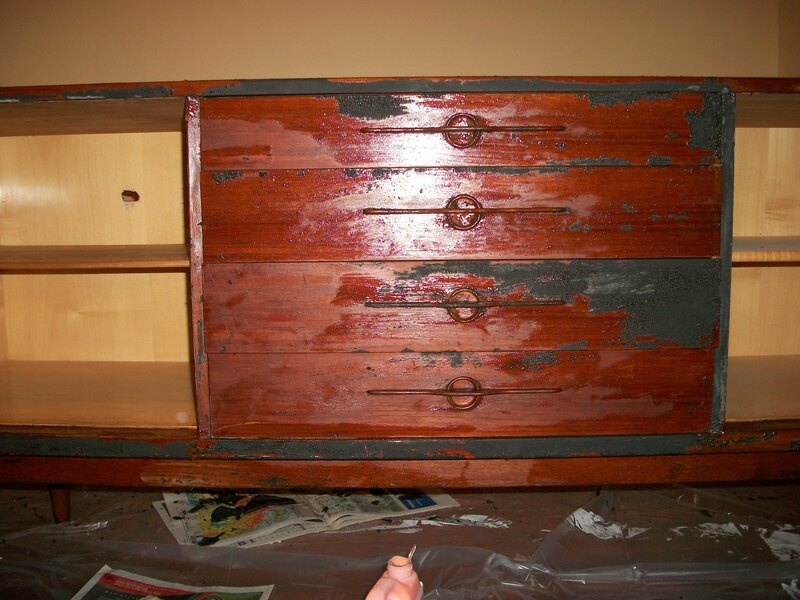 Furniture painting ventures on Pinterest fascinate me, and Kate over at Centsational Girl amusingly posted about how well a product called Citristrip worked for her. What I liked was that I could use it (supposedly) indoors. Since the entertainment center was built back in the day when furniture was made out of real wood, I didn’t relish the thought of dragging it outside; nor did I relish the thought of sitting out of the front porch until the wee hours of the night to be sure that no one would abscond with my beautiful entertainment center in the night while it dried. I was skeptical that a furniture stripper really could be used indoors without a noxious smell, so I threw open windows to create a cross breeze. But, the smell, honestly and truly, wasn’t bad. 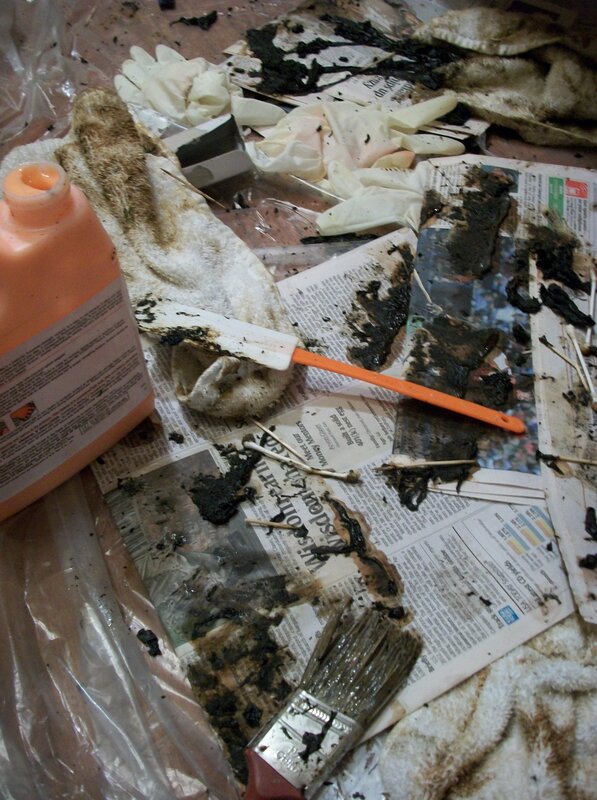 Of course, when using any chemical indoors, I still recommend ventilation when possible. If I remember correctly, I used a high gloss latex paint originally. The stripper said that it would take at least 30 minutes before scraping could commence. However, I noticed when my paintbrush overlapped into sections covered in stripped only moments before that some paint was already coming loose. Besides low odor and fast action, what else was so great about the stripper? It is a rather thick gel, so there was virtually no dripping. Even on the sides of the furniture, it stayed in place to do its job. I painted the stripper all over the piece (except the rollout doors), then I went back to start scraping. A few places didn’t come off right away (probably due to sloppy application). But, I’d say about 85- 90% of the paint came off in the first go round. On that round, I scraped the best I could, found some rags to sacrifice and dry wiped the piece, and then applied a second coat of the stripper to the remaining paint spots. To give you an idea, here is what everything looked like after round 1. Round two started the tedious part because it involved getting paint out of the crevices. Plus, my attention span was flagging. If you have to get paint out of the crevices of furniture, do yourself a favor and arm yourself with two things – toothpicks and q-tips — plenty of both. If I didn’t have them, I’d have lost my mind. Obviously, you should also have on some good protective gloves throughout the entire process. I definitely think it’s not a good idea to come into direct contact with a substance that melts paint. Once I was done with all my rags and toothpicks and q-tips, I thought the floor looked a little like the room of an ER after a trauma case (or at least that’s what it looks like when I watch my guilty pleasure ER shows on the Discovery Fit and Health channel). I tossed that kitchen spatula, but it did come in handy to scrape paint off the curved legs. So, after several hours of stripping, digging paint out of crevices, and yelling at Deogi to stop walking so close to the furniture, here’s the piece sans black paint. Yay! Who cares that it was 11:30 at night when I reach this point and that I would still be up for a few more hours so I could be routed through 3 different Comcast call centers to get the new modem working. A few obnoxious cords rear their ugly selves over the cable box, but now the power strip is tucked back under the entertainment center, and I’ll hide its cord after I mop the floor and stick the board games back under the entertainment center where they are kept so as to lure guests into playing them. Now, I’ve only got two problems. Unfortunately, stripping the paint did seem to strip off a protective coating that I think used to be on the piece. I don’t want an ultra shiny shellac or poly coating on the piece, but the wood does look a little raw right now. Anyone have any suggestions for what I could rub into it to bring out the natural grain and give it a little protection without going overboard? Also, I’m not fond of the color of the wood against the yellow walls. Uh-oh. Thoughts of repainting the living room were already faint in my mind before this little undertaking, and now, I’d really like to repaint. Ok, I don’t actually want to repaint (as in the process of doing it), but I would like the walls to be a new color. However, I’m going to make myself solemnly swear not to do that until I finish painting the trim and hallway ceiling that have never even gotten their first round of attention. Still, I might not be able to resist picking up some burgundy paint chips the next time I’m at Home Depot. I’m linking this project up to one of my new favorite blogs, Young House Love, which is my new favorite substitute for the DIY channel — and if you know me, that’s saying a whole lot. Right now there is an unofficial spring Pinterest Challenge afoot paired with a link party. If I let myself fully explore all those links…well, I just can’t until I get this grading submitted. This entry was posted in decorating, Pinterest and tagged decorating, Pinterest, Project 2013. Bookmark the permalink. Good job! 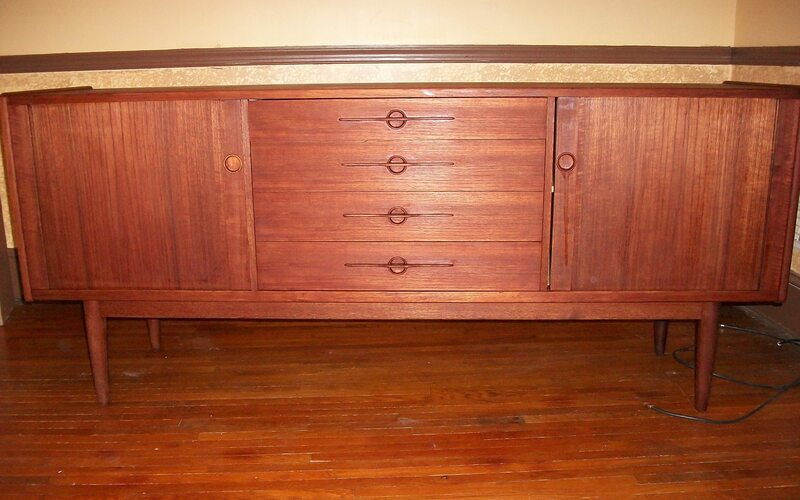 There are all kinds of furniture waxes out there to buff up your beautiful piece that will protect it and add a glow. I hope your company (and you!) enjoy the fruits of your labour! Thanks! So glad you commented. I’m excited to follow your projects. Those window blinds that you recovered look like a smashing success. Well done! Beautiful – so much nicer!